About three weekends ago, we went out to Mr. Johnson’s farm with the trailer. I had stopped by there the previous week when I saw him out and about and asked him about some of the really old hay bales he had setting outside. 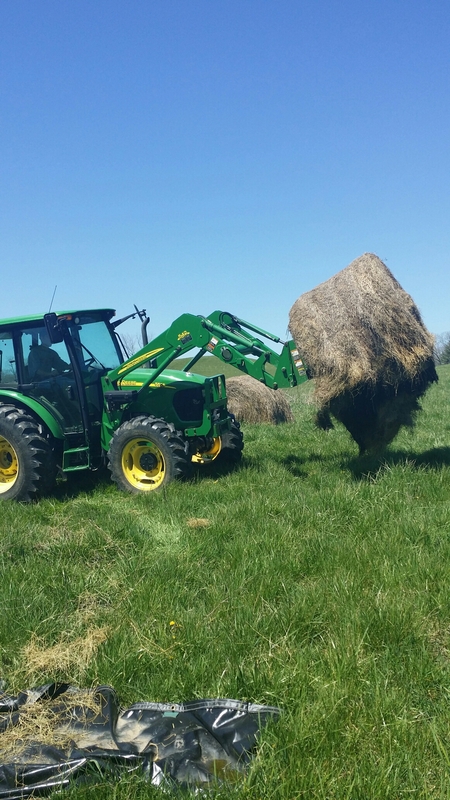 Once hay has been setting out for about a year it loses a lot of nutritional value. Farmers then sometimes use it for bedding, but once it gets to the point where it’s completely falling apart, it really isn’t good for much except compost and putting it into your fields when you’re going to reseed. 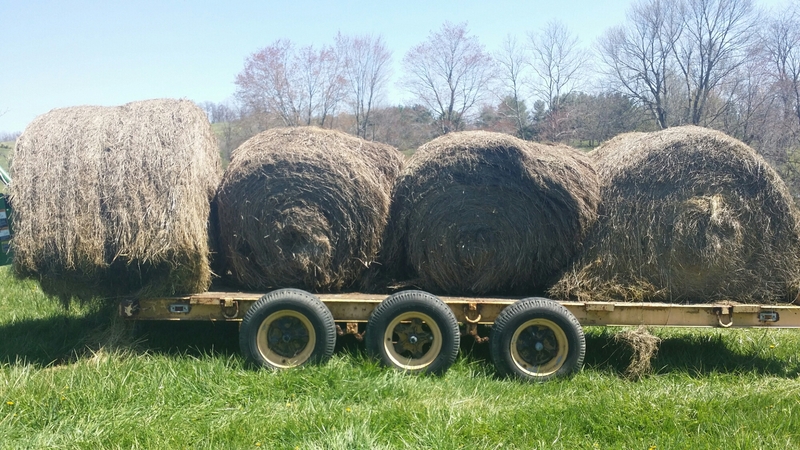 I asked him how much he would charge us for these bales, and he said to come on back over with trailer and we could have some for free. When we got back over there, he had his son there to run his tractor. At the time Mr. Johnson was in an arm sling from trying to catch a buck goat who tore past him so fast that it ripped his bicep off of his arm inside! He had to have work done on his arm because of that, and then a couple of weeks after that we had ice and snow, and he slipped and fell down a couple of porch steps and hurt his back. Still, even with all of that, he was outside working with his animals and taking care of farm business, and he was kind enough to give us the old hay for the field. We put it to good use! 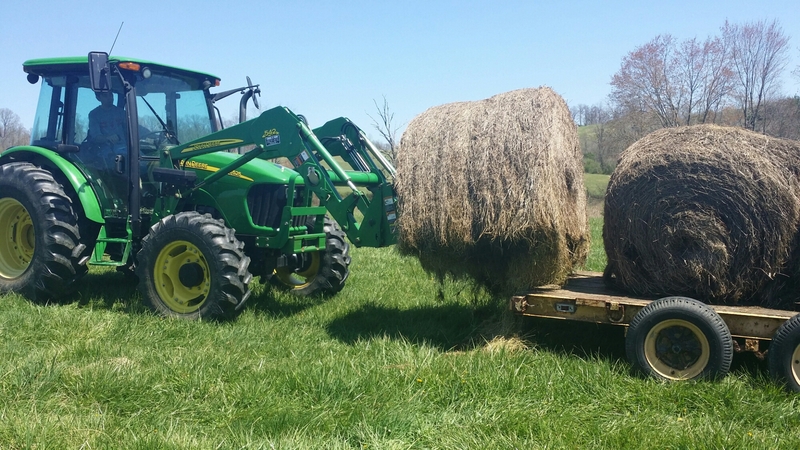 Ted use the seeder that we bought from the Christmas tree farm down the road and dumped at least 200 pound of seed all over that pasture, and then using our tractor he unrolled these old hay bales here and there to try to keep the seed on in case it poured the rain. He was down there this evening, and he said that he thinks it worked because our pasture is getting really green! Instead of looking like we’re raising cattle in a dirt lot over there, it looks like we may actually be getting a field! This is a big thing for us because we want to have our beef and dairy cattle grass-fed. They will get a little bit of grain each night, but the majority of what they eat will be from the field. This is really exciting news, and we couldn’t have done it without the kindness of fellow farmer, Mr. Johnson!! ← Pigs DO love mud!